You may not think about it deliberately, but the snowy pavements and roads may be less pleasant for your faithful furry friend than you thought. Rock salt that is spread by gritters on the road can cause serious problems in your dog. Road salt, or rock salt, can be dangerous to dogs. This is because dogs (and cats) who are walking outside during the snowy days collect rock salt and antifreeze substances on their paws and try to lick them off when they get back inside. Any salt that gets into their stomach can make your dog nauseous or cause diarrhoea. A few milligrams per kilogram of dog or cat could even be fatal! As a result, this is especially dangerous for smaller dogs. 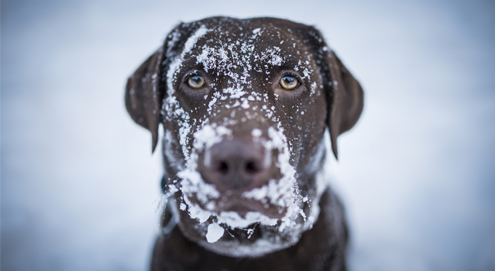 Pet owners who walk outside during the cold months have to be extra careful when walking their dog during snow-fall. Dogs have a risk of getting salt between their paws, which can cause irritation or severe skin complaints. Road salt can even leave deep cracks on your dog's paw pads. If you would like to prevent these painful symptoms, rub your dog's paws with Vetramil Paw Wax before taking him outside. This wax provides a protective layer on your dog's paw pads and protects against road salt. Clean your pet's paws with lukewarm water after going outside. You can also use dog shoes to protect your furry friend's paws from the weather conditions outside. Paw protection on the most challenging surfaces. Supports the recovery of damaged paw pads. Protects your dog's paw pads against damage & irritants on the road.